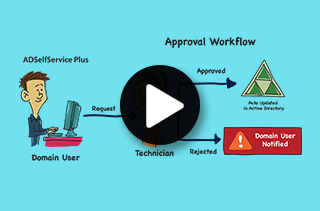 Why approval workflow for self-service? Security and usability concerns have kept many businesses away from giving password and IT self-service solutions a try. 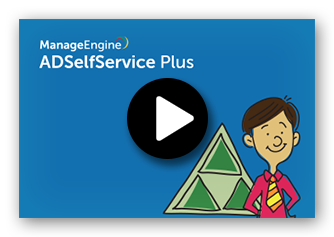 ADSelfService Plus’ Approval Workflow for self-service helps businesses confidently embrace self-service solutions by letting IT admins and help desk technicians keep control of users’ self-service actions. Once enabled, all self-service actions by end users, such as self-password resets, self-profile update, and self-service group management, will go through a predefined workflow. Help desk technicians can review the self-service requests for security and data quality before approving them. A secure and consistent self-service: Help desk assisted password reset, account unlock, self-directory update and group subscription ensures that the self-service operations performed by end users are secure and consistent. For example, if the mobile number self-updated by a user doesn’t match the format used by the organization, it can be rejected by the admin before it gets updated in Active Directory. Reduced costs and improved productivity: Empower non-IT staff to oversee important, yet day-to-day activities such as group management and directory profile update. Put the onus of verifying a user’s self-service action, such as a group membership request, on the group owner or user’s manager. Free up IT staff to focus on other important activities. Freedom to choose pure vs. assisted password self-service: ADSelfService Plus supports OU and group-based policies through which certain end users, such as managers and C-level executives, can be provided with a pure password self-service experience, while other users’ self-service requests such as password reset and directory self-update go through the approval workflow process. 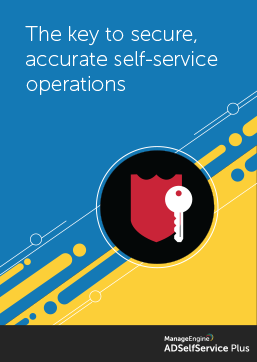 Read this solution brief to see how approval workflow for self-service can help you ensure security and consistency of users' self-service actions.